Every city has its moment – a time when events and people converge in one place to define it for years to come. Drill down and those moments – often decades long – are generally associated with neighborhoods – Montmartre in the first years of the 20th Century, Harlem in the 1920s, Soho in the late 1970s and early 1980s. 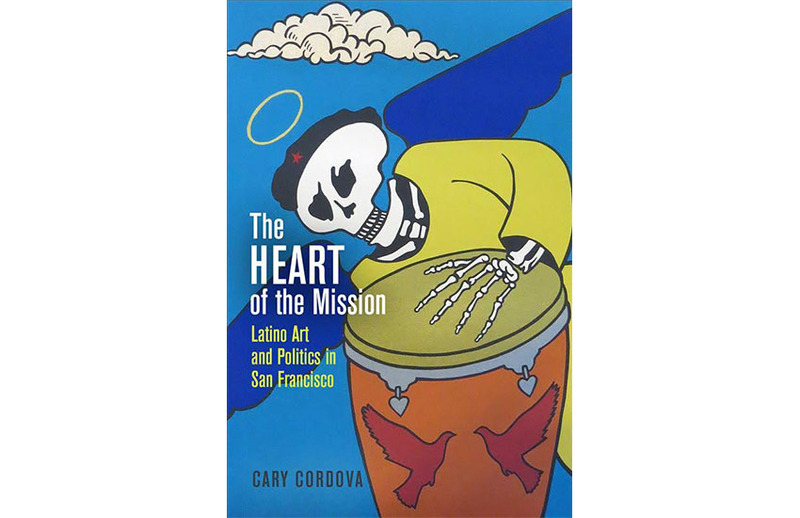 Cary Cordova’s new book, “The Heart of the Mission, Latino Art and Politics in San Francisco,” offers the first history of the Mission District’s moment – a confluence of art and culture that began in the late 1960s and lasted into the 1990s. The Beats, jazz, the 1968 student movement and the Central American wars all fueled a Mission Renaissance. “The Heart of the Mission” is a lively guide through this history, but it’s also an important book in documenting and contextualizing the work of Mission artists. Cordova, a San Francisco native who teaches at UT Austin, traces the beginning of the Mission Renaissance back to the Latin Quarter in North Beach, and such early institutions as The Unión Española, also known as the Spanish Cultural center, a block away from Our Lady of Guadalupe Church. Latin music seeded San Francisco’s bohemian culture through some of the center’s tenants including the 1941 Marimba Club and the 1967 Tropicana Club. “By the 1970s,” Cordova writes, music of the North Beach Latin music scene had relocated to the Mission District.” Muralist Patricia Rodriguez describes to Cordova what that sounded like: “In every corner in the Mission in the seventies Santana was playing, Malo was playing, whoever was playing in the street.” Drumming sessions became part of Dolores Park culture, precipitating a debate over the right to occupy public space in the city”. While a pan-Latino arts community would follow, initially Latino artists and musicians played in the city’s “avant-garde milieu” and “the evolving bohemian counterculture, perhaps most notably embodied in Beat and jazz cultures,” Cordova writes. The San Francisco Art Institute – then the California School of Fine Arts –and its training in abstract art and Bay Area figurative abstraction influenced artists such as Luis Cervantes, José Ramón Lerma and Ernie Palomino. Later, when the Mission District and its artists became identified with political and mural art, these and other artists continued to produce first-rate abstract, pop and assemblage art. Gallery artists had a difficult time getting recognition, but the media discovered the muralists early on. The artists working in 1974 on Homage to Siqueiros inside the Bank of America building at Mission “created a media spectacle designed to undermine their corporate sponsor, while the artists of Latino America caught attention as one of the first all-female community mural groups in the nation.” From the outset, politics – local and pan-Latino – were embedded in the mural tradition. Cordova provides an excellent narrative and analysis of both murals. She also documents the shift provoked by the Central American civil wars, most visibly on Balmy Alley where in 1984, 27 artists contributed 27 murals attacking U.S. intervention in Central America. “The concentration of murals in a single block proved an astonishing display of diverse aesthetics and shared politics,” Cordova writes. If you thought you knew Balmy Alley, think again. Cordova recounts its history but also gives a close contextual look at the iconography, often supplemented by interviews with the artists. And she goes deep: Balmy Alley, we learn, was a needle strewn alley in 1972 when artist Emilia “Mia” Galaviz de Gonzalez envisioned it as a Mexican garden with murals of flowers, birds and fish. To demonstrate the threads of these relationships, Cordova follows the November 1968 “Third World Strike” at San Francisco State and its impact on Juan Fuentes, Rupert García and Yolanda López. López and others also embraced an alliance with the Black Panthers. From the politics we better understand López’s complex and stark posters. Another section follows the trajectory of three Salvadoran artists, Romero G. Osorio, Martivón Galindo and Victor Cartagena, and shows how closely their Salvadoran roots affected their journeys and those of fellow Salvadoran activists, some of whom joined the Salvadoran guerrillas and Nicaraguan Sandinistas on the front lines. There is a rich history of how Día de los Muertos or Day of the Dead, “provided a cultural nexus for mourning in the 1980s in San Francisco.” Grief consumed a city in the midst of the AIDS crisis, but also families losing loved ones in Central America as well as on the streets of San Francisco. The Mexican tradition, which René Yañez and Ralph Maradiaga at Galería de la Raza, took into the public sphere in 1972, provided a collective release and remembering. This summer has produced a number of retrospectives of artists left out of museums during the periods when they created art. These include the Brooklyn Museum’s “We wanted a Revolution – Black Radical Women, 1965-85,” New York MOMA’s Making Space: Women Artists and Postwar Abstraction,” and finally, in SF, the deYoung’s “Revelations: Art from the African American South.” Perhaps it is time for a retrospective of the Mission Renaissance–one that attempts, as Cordova succeeds in doing, to more than scratch the surface. A retrospective would showcase some of the artists featured in the book–Graciela Carrillo, René Yañez, Romeo G. Osorio–as well as the exquisite work by such artists as López, Garcia, Fuentes, Enrique Chagoya, Juan Pablo Gutiérrez and many more. In the meantime, you can start by paying closer attention to the historic murals on Balmy Alley and elsewhere in the Mission as well as the art from newcomers and old timers showing up at the Galería de la Raza and other neighborhood galleries. I will be interviewing Cary Cordova at a book event on August 17th at the Mission Cultural Center for Latino Arts, 2868 Mission St. The event will include music, free tapas and it will run from 6:30 to 9:30 p.m. You can get free tickets here. That is an beautiful summary of a pretty amazing book. It is inspiring to realize that we live in the center of this Cultural reality, one that today more than ever needs to be understood and defended. See you at the book presentation at MCCLA. An incredible book; one that should be read by anyone interested in the Mission District and San Francisco history in general. Don’t miss the event with author Cary Cordova at the Mission Cultural Center on August 17th!